Are you going to the All-Ireland Irish Craft Beer Festival This year? The Festival is coming to the RDS in Dublin on the 7th of September till the 9th of September. It is a weekend you don't want to miss! 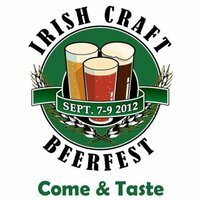 This weekend celebrates the Irish craft brewing, live music and some great Irish artisan food stalls. Featuring approximately 20 craft brewers, both local and "guest" breweries, the festival is expected to attact over 5,000 attendees throughout the weekend. This year, the team is looking forward to showcasing niche brands, new products and pipe-line products, as well as providing craft-beer lovers with technical advice on brewing and the opportunity to meet the brewers. For the first time, the festival will launch with a one-of-a-kind beer and food pairing evening on the 6th September, offering guests the opportunity to learn more about the different attributes and traits of Irish Craft Beers as well as providing a deeper understanding on which foods compliment different types of craft beers. Would you like to win tickets to the All-Ireland Irish Craft Beer Festival and an overnight accommodation voucher for Bewley's Hotel Ballsbridge? Where is the All-Ireland Irish Craft Beer Festival being held this year? All answers must be submitted to marketing@bewleyshotels.com with "Irish Craft Beer" in the subject line together with your name, address and contact details. Entries must be in by 31st of August 2012 - winner will be announced shortly after! As always you be a fan to enter... so like us on Facebook!